Leyte and Samar were two of the worst hit provinces when Super Typhoon Yolanda (Haiyan) made a landfall last November 8, 2013. Aside from conducting immediate relief operations, part of the rehabilitation and reconstruction efforts of ABS-CBN Lingkod Kapamilya Foundation, Inc. over the past ten months has been to provide different forms of training and capacity building to those affected by the calamity. One of ALKFI's programs, Bantay Kalikasan, has recently partnered with the Miriam College Environmental Studies Institute to conduct and organize a three-day seminar dubbed “Handa Ka Ba sa Isa Pang Yolanda? 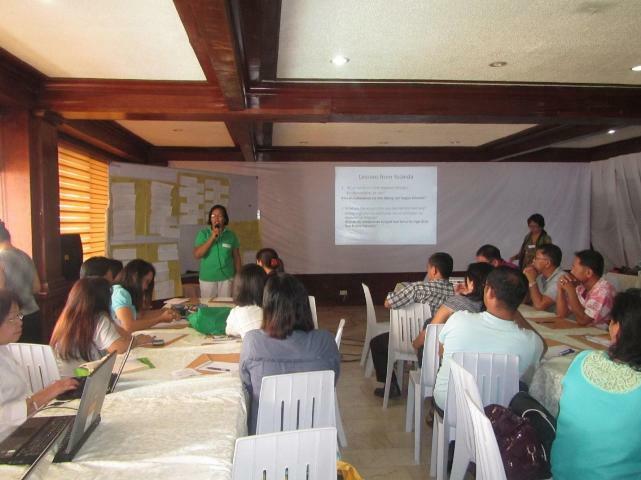 A Trainers' Training on Community-Based Disaster Risk Reduction and Management." The almost 40 participants of the seminar came from the communities, schools, and local government of the municipalities of Dulag, Leyte and Basey, Marabut, and Sta. Rita, Samar. The seminar was designed to train the participants in disaster risk reduction while also informing them of the environmental issues and problems that contributed to the disaster. Psychosocial processing of the experience was also conducted, helping the participants move on and progress towards rebuilding. Workshops were given to recognize the lessons that the past super typhoon brought and to create an action plan for disaster preparedness. The goal of the seminar was for the participants to be able to train others in the same principles, with the hope of better preparing the communities for any future hazards. “Handa Ka Ba sa Isa Pang Yolanda?” is just one of the interventions that ALKFI is conducting in the Yolanda-hit areas. To know more about ALKFI’s rehabilitation projects, visit http://www.abs-cbnfoundation.com/ or https://www.facebook.com/abscbnfoundationkapamilya. Bantay Kalikasan is ABS-CBN Foundation's environmental arm. It was launched to serve as a catalyst in addressing the concern over the worsening state of the Philippine environment characterized by air and water pollution, denudation of forests, irresponsible waste disposal and their life-threatening effects. Visit http://www.abs-cbnfoundation.com/bk/ to know more about Bantay Kalikasan of ALKFI.